Shirdi Sai Baba devotee Mamatha from India says: Sai Ram ji, Sashtang Pranams to my lovely father Baba. I am Mamatha, from Bangalore,Karnataka State. I am working as a Lecturer. I am with Mahaparayan, 365 parayan, AASM ( monitoring ) since day 1. I have been experiencing a lot of Sai’s leela but had not shared it here. Today Sai is asking me to post this Leela. 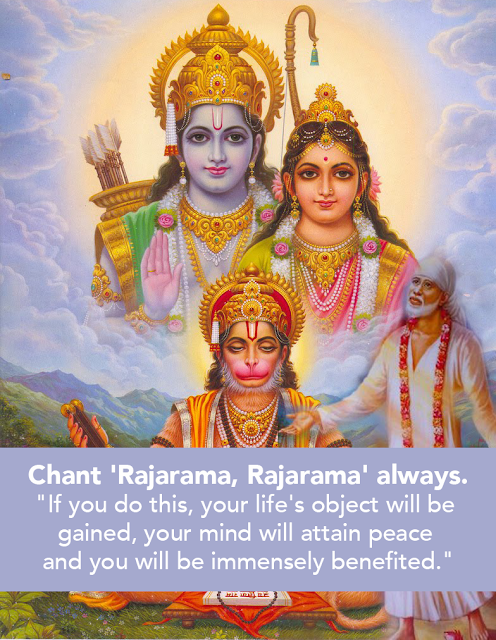 Though it is late yet it substantiate chanting Hanuman Chalisa, which is on its way to prepare a garland. Today evening when I opened MP-20 Sai-Rajni group, I was surprised to read the post which was connected to my dream just 2 days back. The day we started Naam Sapthaha, Baba blessed us with the flower Prasad. My husband Mr Kiran N, started Japa that morning at 7.55 am and Baba gave us Prasad at 8.04 am exactly 9 mins from the time of start. We were happy as Baba accepted our chanting. Later on Rama Navami day too, the last day of Sapthaha Baba blessed us with entire garland. Our Happiness had no bounds. We felt that Our Sai has enjoyed our japa (Entire Sai family ) day before yesterday, 28th March 2018 Wednesday, I was more blessed in a very Unique way. I had a dream in which I saw a big green and lemon yellow colour apps displayed, content not known but suddenly I heard something in marathi language ( may be from apps), which I could not follow. I said “ Sai, I don’t understand Marathi “. A friend( felt but not identified) there said me “ I will translate you what Baba is telling about your Family “. I just said Baba and opened my eyes and saw the time on my mobile, it was 2.02 am. Then fearing of forgetting this dream I typed on my note pad and prayed to Baba,” Sai do help me to know what it is “.and slept. Later again, I was still in confusion whether it was a dream or I was awake as I started seeing a very new place. It was a very, very big hall, and a very divine atmosphere and many of us had gathered there ( felt that we were all Parayanakarthas of this Mahaparayan group ) waiting for some one. Wow, this was the time which everybody anxiously waited for I feel. Our Sadhguru Sainath Maharaj entered this hall, He came very close to me and said ‘Child, you need not worry about anything. I Myself will reveal everything for you.” This was in English. (Suddenly I remembered that I had said that I don’t understand Marathi). Later without me knowing He made me chant a few lines from Hanuman Chalisa, which I experienced as singing Loudly in front of my Baba. It was 2.30 am still. Baba’s presence continued till 3 am then I slept. Got up early but was excited about this dream. Let me share the Shlokas too as this will lead us what Baba wanted to convey all of us. Anth kaal Raghuvir pur jayee Jahan janam Hari-Bakht Kahayee. If at the time of death one enters the divine abode of Shri Ram, thereafter in all future births he is born as the Lord's devotee. Aur Devta Chit na dharehi Hanumanth se hi sarve sukh karehi, One need not entertain any other deity for Propitiation, as devotion of Shri Hanuman alone can give all happiness. Sankat kate mite sab peera Jo sumirai Hanumat Balbeera. One is freed from all the sufferings and ill fated contingencies of rebirths in the world. One who adores and remembers Shri Hanuman. Along with this, one more leela on Rama Navami is worth mentioning. Even on this day when we in group chanted Hanuman Chalisa, Baba gave us a beautiful Rose as Prasad. It was as if He gave from His hand, the flower was sitting in such a tight position close to His heart. Shloka 37 Jaya jaya jaya Hanuman Gosayi Krupa Karahu Gurudev ki naayi. We felt that Guru was indicating something and within two days of my dream and later the same chanting channelised made me happy. Hence shared this with you all. May Baba bless all His lovely children in abundance and give us more love and devotion so that we can enjoy His presence every second. Anantha Koti Bramhanda Nayaka,Rajadhi Raj,Yogiraja,Parabramha Shri Sadhguru Sainath Maharaj Ki Jai. 'Sai' an incarnation of Lord Hanuman ji. Thanks Mamatha ji for sharing the wonderful leela. Its so surprising that Baba is working so mysteriously. He alone knows His ways. He too suddenly gave me the thought of The Longest Garland ( Hanuman Chalisa Chanting Group) around 29th March and made me write the post on 30th March and still everything was in perfect sync (though Hanuman Jayanti was on 31st March) with thousands of chants offered with least confusions. This all shows that He Himself is doing and getting it done; we are just the extremely fortunate puppets. Love You Baba, ever indebted to You Baba. Jai Jai Ho Sai…!